I was “off” my website for the holidays. When I came back in January, I updated to both the most recent version of WordPress and the most recent version of Graphene (theme). Problem: My Amazon Associates links have disappeared, and when I try to add new ones, they do not show up. I have chosen to add a “text only” link to new ads until this is fixed (those still work). I do not see anyone else with this problem (now, anyway), so it may be idiosyncratic. Thank you for any help. 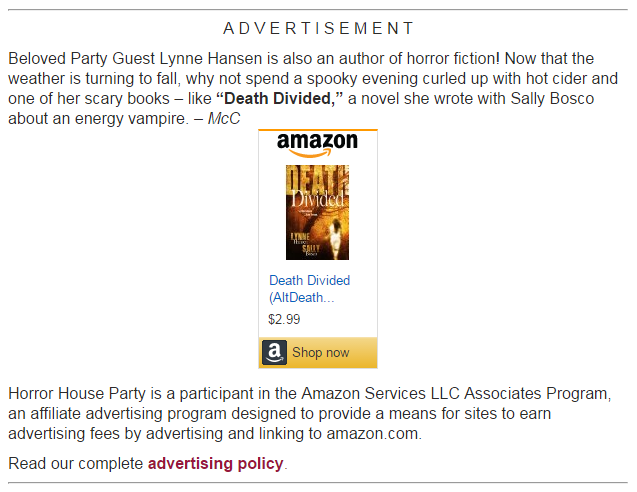 I see the ad for Death Divided at the end of the post. Did you get this sorted? I think that’s right; if it is, try emptying your browser cache. If not, what should I see? That’s absolutely right. I don’t know why I don’t see it. I will try the browser thing. And it’s all fixed. Thank you for your help!